One of the most popular gaming titles in recent years is finally making the jump to next-gen consoles. Mojang announced today that Minecraft is coming to the PlayStation 4, Vita and Xbox One in August . Each will cost $19.99 but can be had for $4.99 if you own the last-gen console version already. There's no word yet on a specific launch date but the developer detailed a few other things about the upcoming releases. In a nutshell, the PS4 and Xbox One editions will include all the features found in the previous versions, and you’ll be able to import worlds created on previous-gen platforms. The new versions will have “significantly bigger worlds” so you can’t go the other way around. "Many, but not all" downloadable content purchased for the PS3 and Xbox 360 versions will be transferable too, with the rest "trapped in licensing deals” unfortunately. Lastly, Cross platform play will not be possible between Xbox 360 and Xbox One, or PlayStation 3 and PlayStation 4. The game’s PlayStation Vita version will be a cross-save, cross-buy title with the PS3 build. 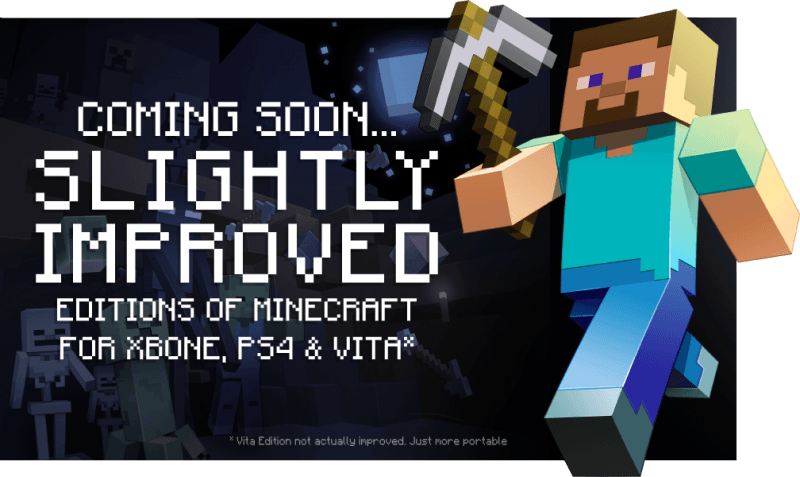 That means any Vita owners who picked up the PS3 version of Minecraft will get the PS3 + Vita Edition for free. You can play on either device, save, and pick up where you left off on the other.